Two examples shaped from my own freewriting in class. Following our recent work with the traditional 5-7-5 haiku format (albeit with subject matter that was more reminiscent of a senryu), I decided to continue an exploration of compressed language forms by introducing my AP classes to a new, less well-known play on the 17 syllable poetic form, the American Sentence. A truly Western take on the Eastern haiku, this form originated by late Beat poet Allen Ginsberg. 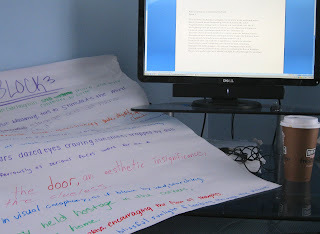 "Publishing" student work from class chart paper drafts. Ginsberg saw haiku, and the American sentence, as a means of compressing poetry to get "Maximum information" with "minimum number of syllables.” This compressed form allowed for the possibility that Ginsberg's notion that poets are people who notice what they notice could be accessible to everyone. Though some of my students struggled with writing "good" haiku, I'm hoping that the more concrete, urban bent of the American Sentence will make for more lively, dynamic drafts. I have taught this form for nearly three years now with what I have felt have been pretty good results. The move from haiku to American sentence is a natural one. While still adhering to the 17 syllable standard of the traditional haiku, the imagery included in the American sentence is presented in a linear fashion reflective of the left-to-right reading of English as opposed to the top-to-bottom approach in Japanese haiku. The process of crafting American sentence is one that lends itself to the existing management activities in my classroom. Students know to pick up their writing journals each day upon entering the classroom. Before even revealing the form, I ask them to freewrite about the lends itself easily to classroom writing process, beginning with a free write. This will give the writer the "clay" with which to shape their lines. The prompt is straightforward: In the next 6 minutes, relax, observe and capture via free write personal sense-based observations about the world around you (our classroom). Use as descriptive a language as you are capable. While it is not incumbent on you to use figurative language strategies, you may find that they come to you—write them down. As a ways of making the form more collaborative, I asked students to contribute to a chain of lines, by first writing two American Sentences, then selecting the one they felt best met the criteria (evocative, imagisitc, approximately 17 syllables in length). This activity was completed for each of my three Advanced Placement Language and Composition courses, resulting in three community poems of 20+ lines apiece. After sharing our class collaborative American Sentence Chain, I task each student with taking the activity home to their friends and families. Students were assigned to both explain this unique poetic form to their victims volunteers and facilitate each person's development of a unique, personal American sentence. The final 17 syllable (fingers-crossed) sentence, was to then be added to the student's own American sentence chain. Of course, if the syllable count varies slightly, that's "all good." The American sentence was the result of Ginsberg believing that haiku in the Western tradition placed too much emphasis on counting (syllables), at the expense of developing image. The goal, as with a haiku, is to communicate and image, and if you're luck (or good) evoke a response in the reader.